If you visit Shoal Bay, you can't miss spotting Pressure King, the biggest smile on the beach, and a great source of rental umbrellas. 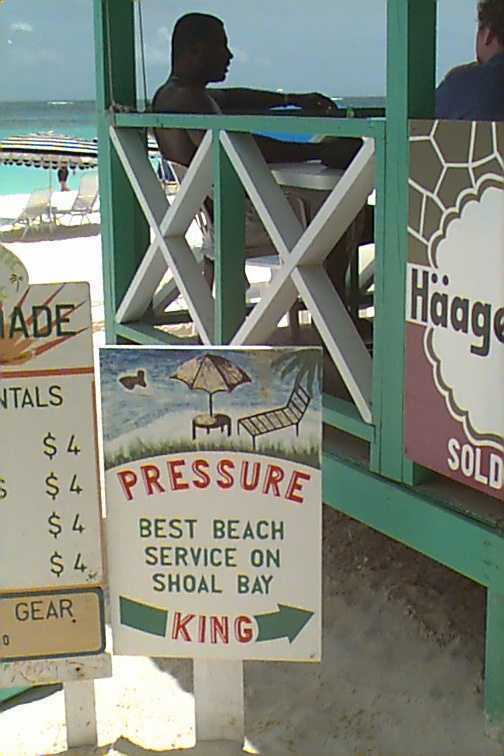 Pressure King, whose real name is Roger Clarke, operates a beach services business at Shoal Bay and can always be found somewhere around Uncle Ernies Bar and restaurant. 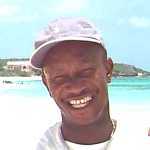 Roger is originally from Nevis, where he was a professional baker for 9 years. 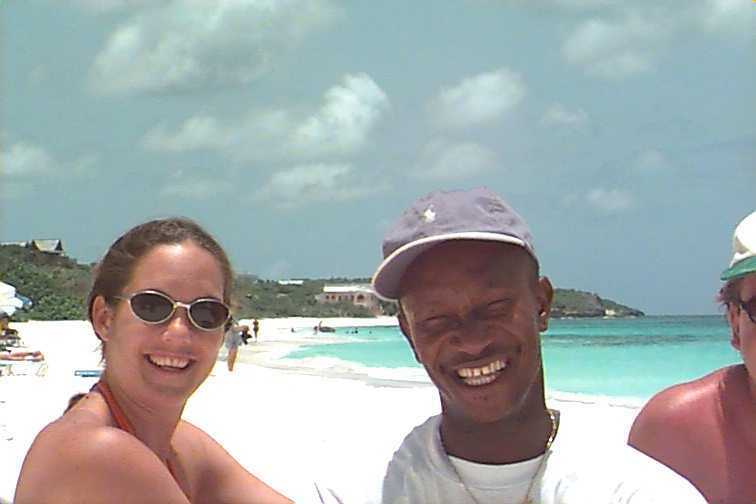 He isn't the only one renting lounge chairs, umbrellas and snorkelling gear at Shoal Bay, but he is the most outgoing. A genuinely nice guy. 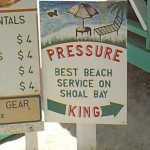 Pressure King has gotten a lot of raves on the Internet from visitors to Anguilla. For example, Kate Ellison honored him with one of her Top 3 Best Characters awards and Stephanie Ruf described him as "the guy with all the gold around his neck...good people!" 1999 Update! Pressure does not spend much time around Shoal Bay anymore. He has a charter boat, the Pressure Queen that operates mostly out of Sandy Ground. Also A Caterer. 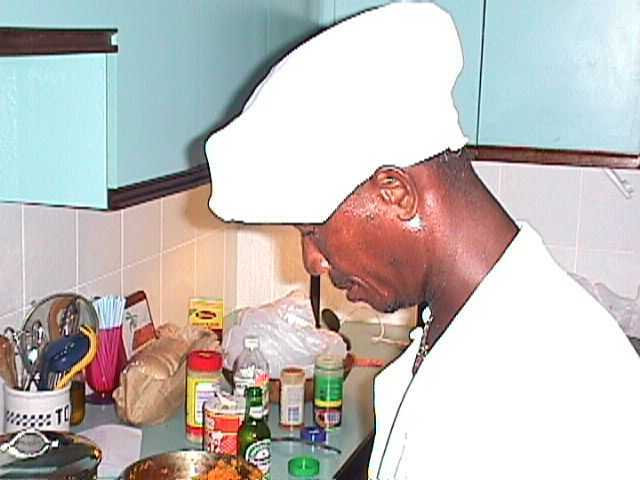 Pressure King doesn't just doesn't just rent umbrellas and lounge chairs, he also cooks. This over achiever has a side business catering dinners for people. He will get all the ingredients, including fresh fish and crayfish, bring them to your house, then prepare and serve your dinner. Very yummy. 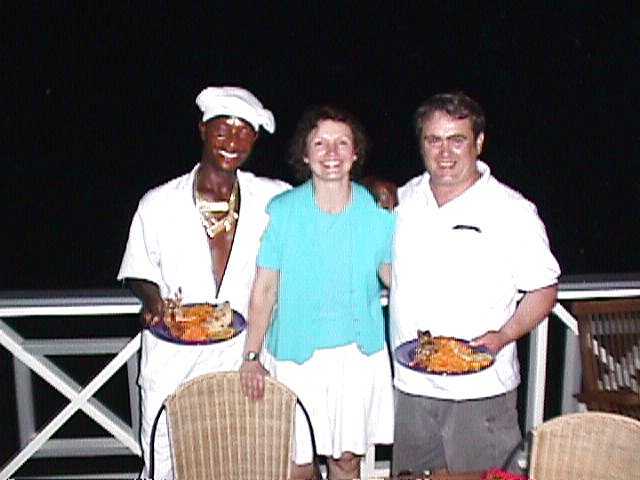 To make arrangements, see the chef on the beach or call him during the day at Uncle Ernie's, 264-497-3907. Thanks for the great little article on Pressure King. Before we visited Anguilla last year, we asked through AOL's travel billboard for info on Anguilla. We had several responses. One asked us specifically to see Pressure King. I printed that letter and took it with me. When I found him, I showed him the letter and told him I got it off the internet. He was sure proud! He is a great guy. One day, around 4'oclock, we were going to leave the beach. He knew us by then, and said "stay a little while longer, there's going to be a beautiful sunset. I'll buy you a beer." The three of us sat on the lounges, drank our beers and drank in the beautiful sunset. We were the only ones on the beach. I took pictures of him a couple nights later, dancing at Smitty's. I sent them to Smitty, and they better be up on the wall when we visit in March!